We fully acknowledge that no place on earth can ever truly make you forget New York City. But, if you’re ready to face reality -- like that the average price of a Manhattan apartment surpassed $2 million for the first time ever this year -- and actually let yourself enjoy life while saving money (now there’s an idea! 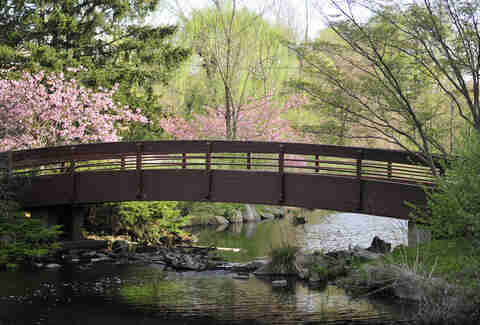 ), these NYC suburbs come pretty close. 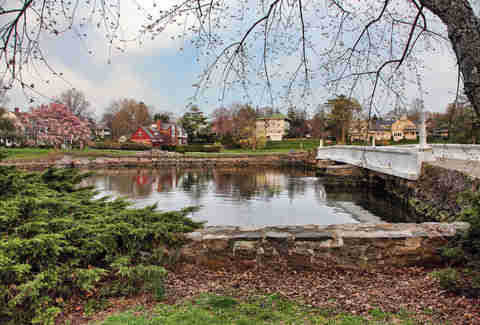 Whether you want a backyard that looks like Central Park, a restaurant scene that rivals the city’s, or an affordable beach town free of tourists, each of these NYC suburbs would serve you well as a Plan B. It spans just six miles -- half the length of Broadway -- but no New York neighborhood could ever measure up to Armonk’s one-two punch of great food and proximity to the outdoors. At early morning favorites The Beehive and Market North, you won’t have to wait in crazy lines for brunch or a nitro coffee. For lunch, you can get brick-oven pizza alongside a local beer at Amore, which seats diners next to a vegetable garden and an actual flowing brook (how many brooks do you eat next to in South Williamsburg?). And you won’t miss the city’s infinite dinner options when you’re having farm-to-table meals from Union Square Cafe vets at Restaurant North or homemade pasta at Moderne Barn. 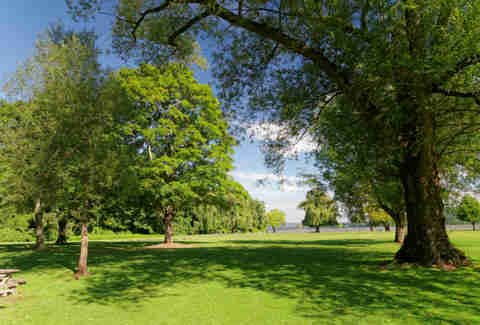 Walking through Wampus Brook Park nature preserve and Kensico Reservoir, you’ll wonder how you ever talked yourself into the idea that McCarren Park was the great outdoors. It’s not all food and nature, though -- this northern Westchester County hamlet, which is just 55 minutes from NYC, is also home to excellent schools and homes that cost less than anything you could buy in the city (the median property value is $992,400). Nestled on the Navesink River, Red Bank is the kind of place where every day feels like the weekend. Its quaint Downtown blends Southern hospitality with the historic grandeur of SoHo (minus all the tourists), and the 100+ eateries -- from Via 45 and Earth Pizza to better-than-Bouchon baked goods at Antoinette Boulangerie, and fresh seafood at the Boondocks Fishery and Catch (not to be confused with the clubby Meatpacking District restaurant) -- ensure you’ll never be bored dining-wise. Beyond the relocation-worthy food, picturesque setting, and cheaper-than-a-NY-studio colonial houses (the rising median home value is $354,100), Red Bank is a town full of other strange but amazing intricacies, like native Kevin Smith’s comic book store called Jay and Silent Bob's Secret Stash, and sidewalk signs that read, “Surround yourself with tacos not negativity.” Amen. 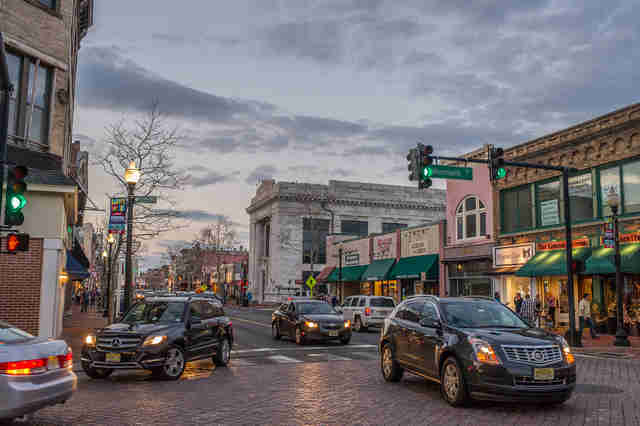 Bordered by the Norwalk River and Norwalk Harbor, SoNo has overcome superstorm Sandy and an economic recession to become the brightest zip code in Connecticut for defecting New Yorkers. It’s an hour train ride to Grand Central, a convenience that’ll matter less and less as you tap into everything this exciting red-bricked neighborhood has to offer. Affordable luxury apartments and new innovative eateries such as El Segundo and Tablao lend SoNo its on-the-rise energy. Strolling Washington St's cobblestone sidewalks, beside 19th-century buildings and a mix of bars, restaurants, and galleries, will make you feel like you’ve held onto the best parts of NYC, minus the crowds, cabs, and expenses. What’s more, it’s a haven for craft beer geeks and cocktail lovers -- there’s Match, The Loft, Cask Republic, Local, and The Blind Rhino -- in addition to a thriving art scene. If you’re ready to take the edge off a bit, a quick 36-minute Metro-North ride to this beautiful waterfront village should be your next move. Larchmont is a world unto itself, where European transplants mix with young parents who are able to commute to the city and let stress easily fall by the wayside come 5pm. 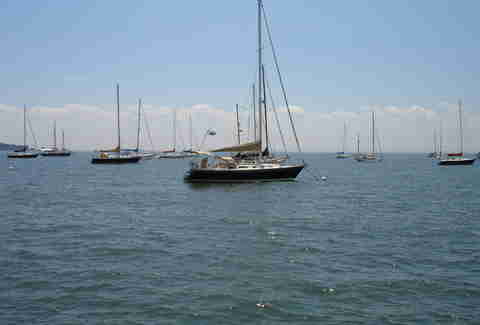 Landlubbers are scarce here, so you’ll have to learn your sloops from your yawls. But if you’re someone who cares about food (and doesn’t hate the idea of having a lot of sailor friends), it won’t take long for you to settle into a new routine that’ll go something like: coffee and an omelet at Stan'z, a run through Manor Park, a French dip sandwich at Sherwood's, hanging out on a giant porch you could otherwise never afford, an afternoon trimming your sails on Long Island Sound, and cocktails and a caciocavallo pie at Polpettina. What's the most underrated landlocked New Jersey town near NYC? That would be South Orange, which happens to have the world’s best sloppy Joe at Town Hall Deli. While the sandwich is great, it’s the town’s whole utopian aura that’s worth staying for. 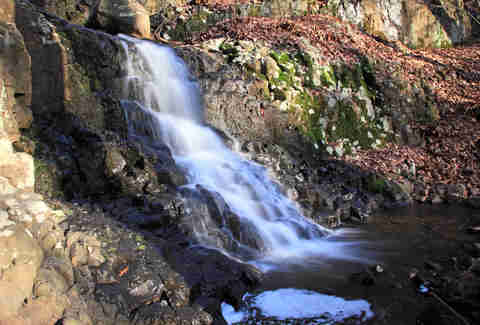 Snug up against the South Mountain Reservation, home to singletrack mountain bike trails and the spectacular 5.8-mile Hemlock Falls loop trail. This diverse, kid-friendly community is a win-win of a move. It’s got a restaurant scene on par with NYC (Falafel-ly Yours, Ariyoshi, and Walia are among the favorites), outdoor recreation easily one-ups Central Park (there’s South Orange Park and Meadowland Park, and that’s in addition to waterfall adventures in the reservation), and the gaslight-lined streets have some of the most architecturally striking houses (with a median home value of $562,800) -- all while being less than 30 minutes from Penn Station. It’s just a 50-minute train ride from the city, but somehow feels like an under-the-radar gem in a different part of the country altogether. Creative locals like Broadway legend Audra McDonald share an infectious work-hard-play-easy mindset that seems inspired by the town’s sylvan setting. The food and drink scene eclipses any hunger pangs for old NYC haunts, with slices at Capriccio II, inventive donuts at Hot Dippity Donuts, cocktails at Justin Thyme Cafe, French food at Tagine, and brunch at The Tavern at Croton Landing, which recently opened an equally good cafe next door called The Sidecar. And you can finally stop depending on all those meditation apps now that you’ll be getting back to nature via kayaking on the Hudson and Croton River, or hiking in Senasqua Park and 508-acre Croton Point Park. Ommmm. Listed on the National Register of Historic Places, Port Jefferson is the next best thing to living on the East End, especially when you consider it’s only two hours on the LIRR AND it has a place called Pirates Cove that resembles a secret beach in the Caribbean. The best part? You won’t even have to share the peaceful shores with tourists. Even if you’re the prototypical five-coffees-a-day New Yorker, you’ll discover that a slower-paced life suits you (and not just on Sundays), as you linger over a coffee and Bombay egg sandwich at newly opened Local’s, a pint at gastropub Brewology or Port Jeff Brewing Company, and the best brisket you’ve ever had at Smokeshack Blues. 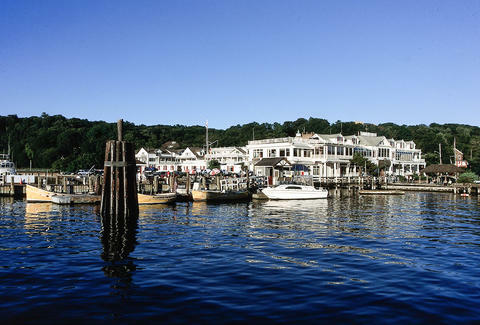 On the lush patio at Old Fields of Port Jefferson or at Lombardi’s on the Sound, you won’t miss your pseudo-romantic, loud sidewalk dinners in the city. 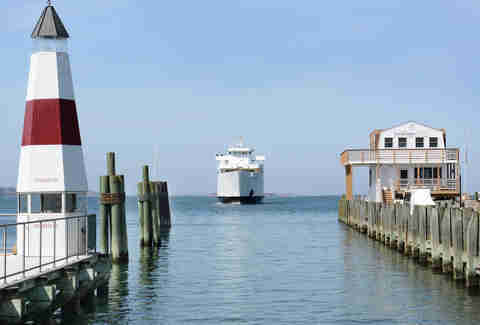 And if you want to get away (for whatever reason), it's as easy as jumping on the town ferry to Bridgeport, CT.
Lauren Matison is a travel writer and co-founder of offMetro.com who still lives in New York with her husband, dog, and baby, while desperately fighting the temptation to move to the 'burbs. Follow Lauren on Twitter and Instagram.